“The tunas are coming! The tunas are coming!” This is no fisherman’s cry in Spain. 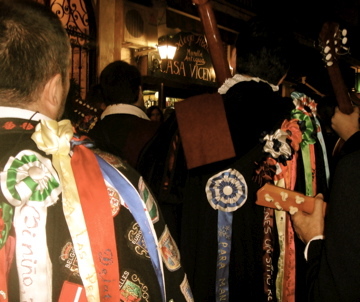 It heralds the arrival of dozens of groups of men, dressed up in antiquated minstrel-like outfits, equipped with guitars, tambourines and sonorous voices ready to serenade the people. The whole group of players and singers together is called a tuna, while just one member is called a tuno. We were told by our Spanish friends to beware the tunas- they have quite the Don Juan reputation. At the same time, the Spanish girls seem to love the tunas. “There’s a tuno!” “Tunos! Tunos!” were the excited whispers heard in the bars and streets. 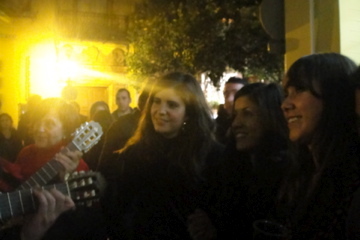 We were privy to both a small serenade by 2 tunos to a couple of the Spanish girls we were with, and a grand spontaneous concert by a whole tuna in a small street behind our apartment. Both were impressive. Both were surreal moments. Both were jarring reminders that we are in Spain. It’s amazing to see a 13th-century tradition alive and thriving! Is this a one night event or all through the Christmas Season? Hi Mom! Unfortunately, I think this was a uniquely special night of the season. 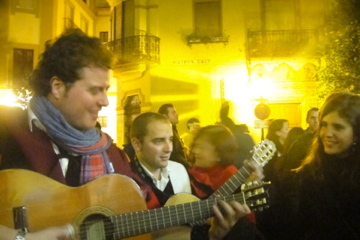 Apparently they also sing around the time of Semana Santa though! jenna, this is one of my favorite posts from your blog. it is SOO interesting!!! i can’t believe they have musical groups like this! how cool! also, i watched your youtube clip – they’re voices are incredible!!! i couldn’t believe that was live!! anyways, do you know why each group is called a “tuna”?? does that have a different meaning in spanish or something?? or is it really referring to the fish?? haha…so interesting! 1) The word for scoundrel or vagabound in Spanish is “tunante.” Since they began as poor university students trying to make some money, they didn’t have a great reputation. 2) The groups move in packs like the actual tuna fish (atún, in Spanish).